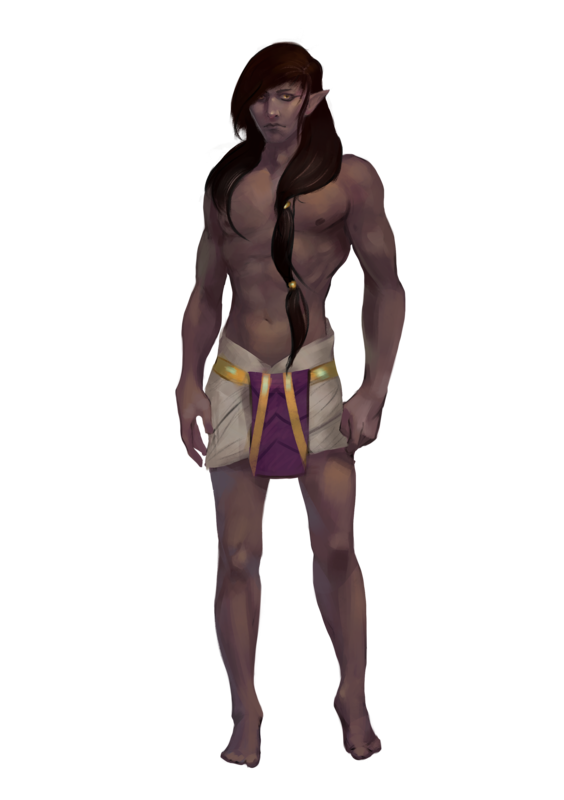 Tezvarnen, also known as Desert Elves, are lean and powerfully built. Common skin hues range from copper to black. Most have cascading black or brown hair. Tezvarnen eyes range from yellow to black. Large tribes of Tezvarnen live in Pax Thallos' Scorched Lands, Scourlands, Kalsar Dunes and the Ad'risean Waste. Tezvarnen tend to get along with other nomadic peoples, however, they often do not enjoy the confines of large walled cities. Tezvarnen lean to the chaotic nature of nomads, and the neutral side of survival, however their alignments can vary as much as the dunes through the ages. Ability Scores: +2 Con, +2 Dex, -2 Int: The desert makes them tough, but there really isn't much need for deep thinking. Medium: Tezvarnen are medium creatures and have no bonus or penalty due to their size. Normal Speed: Tezvarnen have a base land speed of 30 feet. Hard Living: +4 Racial Bonus to survival checks. Sand Step (Ex): When in desert terrain a Tezvarnen leaves no tracks and cannot be discovered by scent or tremor sense. Amazing Hydration: A Tezvarnen can go for an amount of days equal to their constitution score without drinking anything, instead of 1 day + hours equal to their constitution score. After such time they suffer dehydration as noted in the Core rulebook. Warm climates do not increase the amount of liquid a Tezvarnen requires. Immune to Sleep effects. Tezvarnen require the same amount of rest as elves as described in the core rule book and are immune to magical sleep effects as well.